The first time I heard the song, I had been on my feet for 16 hours straight. I hadn’t simply been standing; from the hours of 2am-5am I’d played the classic free throw game, Lightening, with a number of other fellow participants in UNC’s “Dance Marathon,” a 24-hour event where students stood on their feet to raise money for the Children’t Hospital. I’d also participated in a few lively rounds of Four Square; and, as the name of the event suggests, I’d done a little bit of dancing. The bottom line though, other than a few bathroom breaks, I hadn’t sat down in nearly half a day, a direction that wouldn’t come until the closing ceremony at 6pm that night. My legs were screaming. The plastic, powder blue stadium chairs behind me looked as comfortable as a plush recliner. We’d shuffled into the famed basketball arena, all 400+ of us participants, for a change of scenery. Having been in the next-door gymnasium all night, event organizers recognized we needed something to keep us going, and the new surroundings did feel good. A few athletic trainers led us in some stretches, we sung the alma mater, arm in arm, like it’s meant to be sung, all of which helped ease the strain on my aching muscles a little bit. Then… they played the song. For the past several hours, I’d been in survival mode; counting down the minutes, focusing on the next section of the event, doing anything and everything I could to make my exhaustion feel less, whether it was eating the Chick-Fil-A sandwich offered, wandering around the gym, or joining one of those basketball games. But the song brought me back to life. It WAS a great day. After all, what we were doing had a purpose, raising money for the Children’s Hospital. And most importantly, we were getting there. Sure, we had eight more hours to go, but we’d already gotten through SIXTEEN. We’d made it over the major hump. I sucked in the crisp, morning air from the open doorways as the lyrics rang out through the loudspeaker. 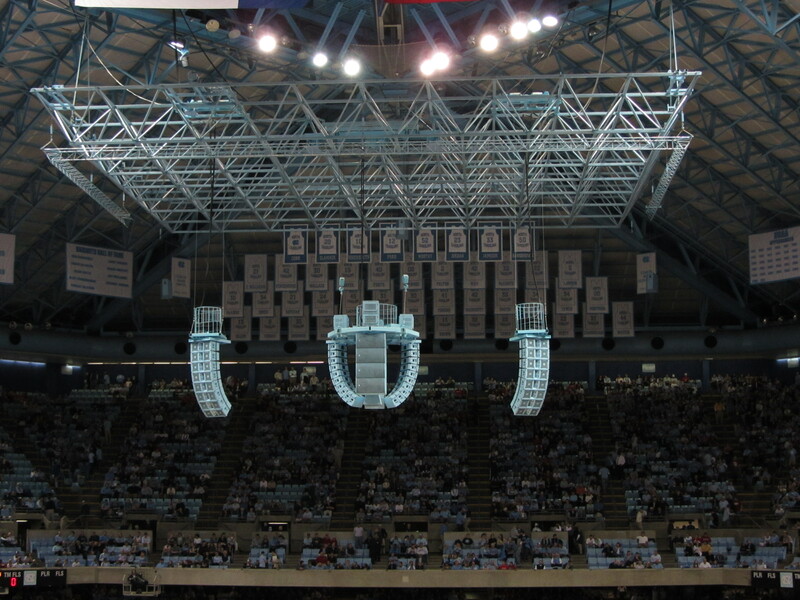 I glanced up at the rafters, noting the famous jerseys — including Michael Jordan’s – hanging from them. And for the first time during the event, I gave myself some credit. Tears even started flowing at one point, the idea — the event — reminding me of my bigger picture freshman year college experience to that point. I’d come a long way. And like the song said, hey, I was doing all right. A few days after my dad’s death in January, I rid my workout playlist of all of my “good mood songs.” Among the casualties was this Travis Tritt hit, along with “Good Life” by One Republic, and “Not Broken” by the Goo Goo Dolls (a song by Lifehouse, titled simply “Broken,” got to stay). I felt weak, lost, and mostly, sad — having a song trying to tell me life was something otherwise was the last thing I wanted. On a drive to Chicago this past weekend, now six weeks later, the song came on the radio. My first instinct was to flick the channel, but instead, I went out on a limb and turned up the volume. Suddenly, I found myself singing along. I didn’t feel “healed” yet by any means; in fact, I knew the term “healed,” may not ever really apply. As everyone keeps telling me, life is a “new normal” now. But like I did standing in that gym 12 years ago, I acknowledged, as I sang those familiar words, just how far I’d come these past few weeks. I’d made my way out of “survival mode,” this trip to Chicago proof as much as anything — I planned to catch up with some good friends from college, go running downtown, and go out with a big group for the much-anticipated Carolina/Duke basketball game that Saturday night. The days of seemingly endless sobbing had mostly passed; I still had my teary moments of course, but they were moments, not full days like the first month had brought. And certain things I’d avoided, like major sporting events, I didn’t mind turning on now, the painful reminders of my dad a little less painful, the joys I’d once found in them returning. I still had a ways to go, I still missed my dad terribly, and I had no doubt that the rest of my life would be filled with bittersweet instances, times I just wanted to talk to my dad, or see him, times that made me sad. But the thought that I was in a better place than I was six weeks ago; that maybe, just maybe, I was over that major hump and ready to focus on the bigger things in life again, rather than simply getting through each day, suddenly made me feel capable — strong, not weak; on the right path, not lost, and even happy, not sad. I glanced out my window at the sun that was indeed shining and realized I was doing “all right.” Today, just like the days ahead, had the potential to be a great one. The trip to Chicago turned out to be a blast, the run downtown refreshing, catching up with good friends great. Carolina (my team) did lose the game pretty bad, but that’s okay. The weekend had other victories.